Maureen Ruscheinsky, Author at Out And About With Mo! Out And About With Mo! Theatre, dance, activities for all – a look at what's going on In Vernon. • 3296 sqft , 3 bath , 4 bdrm single story “Level entry with walkout basement” – FOR SALE CAD675,000 . Priced to sell! This lovely 4 bedroom home in Canadian Lakeview Estates is located in a quiet area with a stunning lakeview. Level entry with a walkout basement, this spacious home is perfect for a family. The deck on the upper floor takes advantage of the lakeview and sunsets as does the lower patio. The oversized lot affords privacy and lots of room for family fun! The main floor has 3 bedrooms, 2 of which have access to the deck. The master suite is spacious and has a soaker tub. The dining room has lots of space for a family sized table and a buffet. The basement has 10 ft. ceilings giving the space an airy feeling. Another bedroom and full bathroom makes this space perfect for guests. The large family/games room leads out to the covered patio, perfect for those hot evenings! The media room has a projector and screen for movie nights. The den/office is spacious & affords space for extra guests. A large storage/mechanical room complete this level. Beach access available for a yearly fee of $100 per year. • 1118 sqft , 2 bath , 2 bdrm single story – FOR SALE CAD299,900 . Priced to sell! • 2502 sqft , 3 bath , 1 half bath , 3 bdrm 2 story – FOR SALE CAD619,000 . Priced to sell! 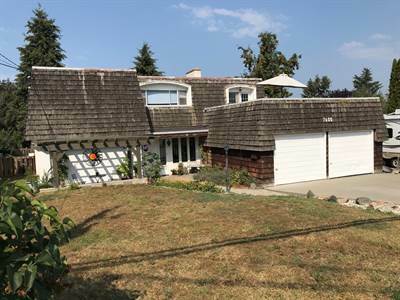 This delightful 3 bedroom home with pool on .30 acre is family ready! The pool is set in a private yard that is fully fenced. There is a garden area for the gardener as well as raspberry bushes, grapes and a plum, apple & cherry tree. There is a covered patio out back and a lovely sitting area at the front. A deck off the living room looks out over the treed back yard to Kal Lake while at the front an oversized deck affords views of the hills and valley. The living room and kitchen area are a great size for entertaining with a family room on the lower level. As an extra bonus there is a self contained area that is being used as a salon, but could easily be a home office, complete with a powder room. 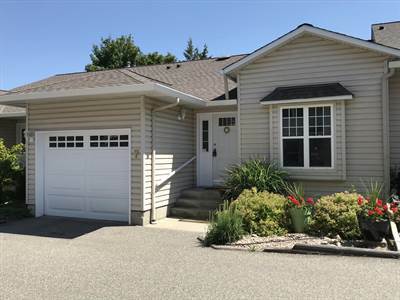 The location is excellent with Kal Park and beaches minutes away. For families, schools are also minutes away. The perfect Coldstream home! • 1062 sqft , 2 bath , 2 bdrm single story – FOR SALE CAD320,000 . Priced to Sell! 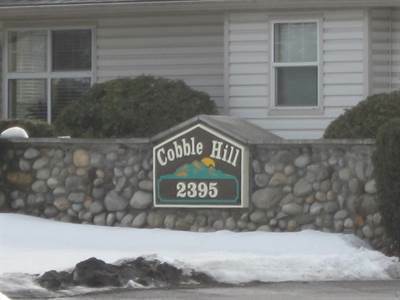 This centrally located 2 bedroom condo is perfect for the empty nesters or first time buyers! Well kept and very comfortable, this home feels warm and inviting. The kitchen is nicely set up for ease of meal prep and comes complete with stainless steel appliances. The open floor plan and stand up bar is perfect for guests while entertaining. A door from the living room leads out to the patio. It is a welcome private oasis to relax on & enjoy morning coffee or some gardening. The second bedroom has an adjoining bathroom making it perfect for overnight guests or an office. Walking distance to most amenities, this is a perfect home! 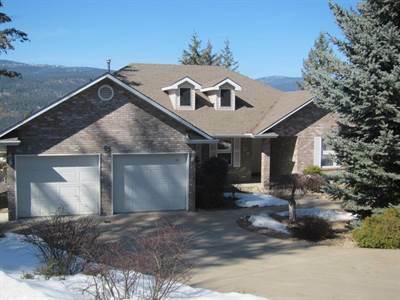 • 3404 sqft , 5 bath , 1 half bath , 4 bdrm 2 storey – FOR SALE CAD819,000 . Priced to sell! 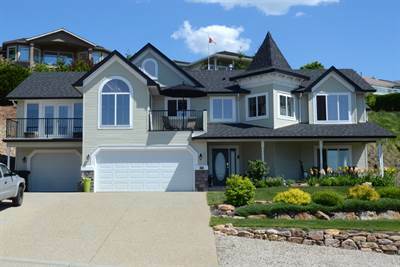 This beautiful Coldstream home is perched at the end of Kal Lake with a spectacular unobstructed view. Imagine waking up to this view and having coffee on your private deck off the master bedroom. The ensuite has heated tile flooring and a walk in tiled shower with numerous shower heads. The second bedroom has an ensuite with soaker tub and a deck to enjoy the same view! A spacious sunken family room has french doors leading to your private sancuary complete with waterfall, covered BBQ area & 3 deck areas. A hottub is situated to enjoy the breathtaking lake view. Wander into the kitchen through french doors off the upper deck. A great space for entertaining with a granite eating bar, stainless steel appliances including gas stove top with electric oven, microwave drawer. The adjoining dining room gives ample space for formal dining. The living room boasts the same lovely view with a fireplace for the cool winters. Down stairs you will find a cozy 2 bedroom suite for extra family. There is a separate laundry & entrance for convenience & The View! A large studio, once a double garage has sink, counters and a 2 piece bathroom. Can easily be converted back to a garage or become a workshop! All areas have heat and cooling. Schools and beach are close by. What a great family home! There is also room for your R.V. or boat! • 1118 sqft , 2 bath , 2 bdrm single story – FOR SALE CAD274,500 . Priced to sell! 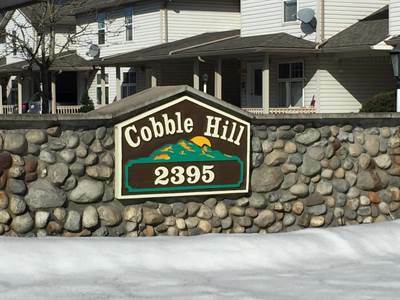 Welcome to Cobble Hills! 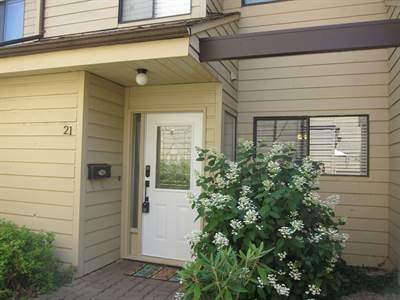 This 2 bedroom one storey condo is located in a family friendly complex. Perfect for first time home buyers or empty nesters. 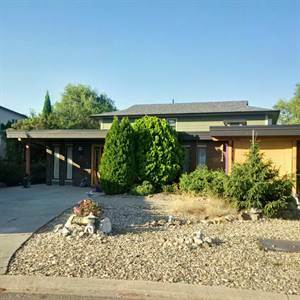 Being an end unit this home is very bright with lots of windows and an open floor plan. The warm colour scheme makes the home cozy and inviting. The ensuite has a soaker tub and both bathrooms have new linoleum. French doors lead off the dining room onto a deck, perfect for summer barbeques. The yard is extra large and fenced for your small dog. Pets are allowed, either 2 dogs 16″ in height or smaller or 2 cats! This wonderful home is also located close to schools and shopping. • 1160 sqft , 1 bath , 1 half bath , 3 bdrm townhouse – FOR SALE CAD249,000 . Wonderful family home located in a family oriented area near schools. This lovely 3 bed plus den home has been tastefully renovated. New roof, siding, windows, flooring and paint in 2011. The main floor is a spacious open plan with an island, new cabinets (2011) in the kitchen, small patio off the dining area (perfect for the BBQ) and a large living room. An office with built in desks and shelving and a large entryway complete this level. Off the kitchen, as an extra bonus, is a large pantry. Upstairs is a bathroom, 2 bedrooms and an oversized master bedroom with large walkin closet and ensuite. The lower level offers a family room, den, powder room, laundry and workshop with a door leading to a small patio or work area. Finally a covered deck off the family room leads to a private back yard and an extra deck area with a pergola, perfect for entertaining on summer evenings. The home has timberframe detailing adding to the overall appeal of this home. 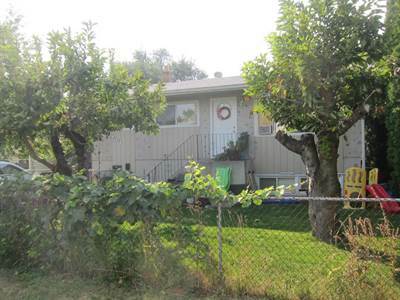 • 1652 sqft , 2 bath , 4 bdrm single story “Plus basement” – FOR SALE 350000 CAD . Priced to sell! Lovely 4 bedroom home, perfect for a family or as an investment. 2nd kitchen and laundry downstairs, perfect for the inlaws or returning family members with a separate entrance. New in 2005 – roof, windows,counters and flooring. The large back yard is fenced and has a double storage shed. Located close to schools and shopping! Great value in this compact home!